These mini heart cinnamon roll cakes make a great treat filled with a cinnamon sugar swirl and topped with a sweet glaze and pink sparkles. Valentine’s Day is the perfect excuse to bake some sweets. A while back I made some yummy chocolate heart cookies filled with pink buttercream frosting. Today I’m putting a spin on a classic cinnamon roll but making it into a cute little heart. This way you can feel okay eating them for breakfast too. It all starts with these super fun heart-shaped baking cups . They are reusable and very flexible so it’s pretty easy to pop out your cakes once they have had a chance to cool for a bit. To get the classic cinnamon roll taste, I made a separate cinnamon sugar mix which was placed on top of the batter. Then I used a toothpick to swirl the cinnamon sugar and batter together. This is what they look like when they come out of the oven. Looks like at least one had a little too much batter. Now, you can leave them like that but I decided to flip them over and drizzle a glaze on top. Then a little pink sanding sugar added to the glaze for a holiday look. This recipe only makes a dozen cakes and that’s exactly the number of baking cups I have so that worked out well. Unfortunately, we loved them so much I kind of wish it made more. P.S. Chocolate heart cookies filled with pink buttercream icing are another great Valentine’s treat. For something a little fancier try making a Chocolate Charlotte cake. It’s a little like a chocolate mousse cake with pretty ladyfingers around the rim. 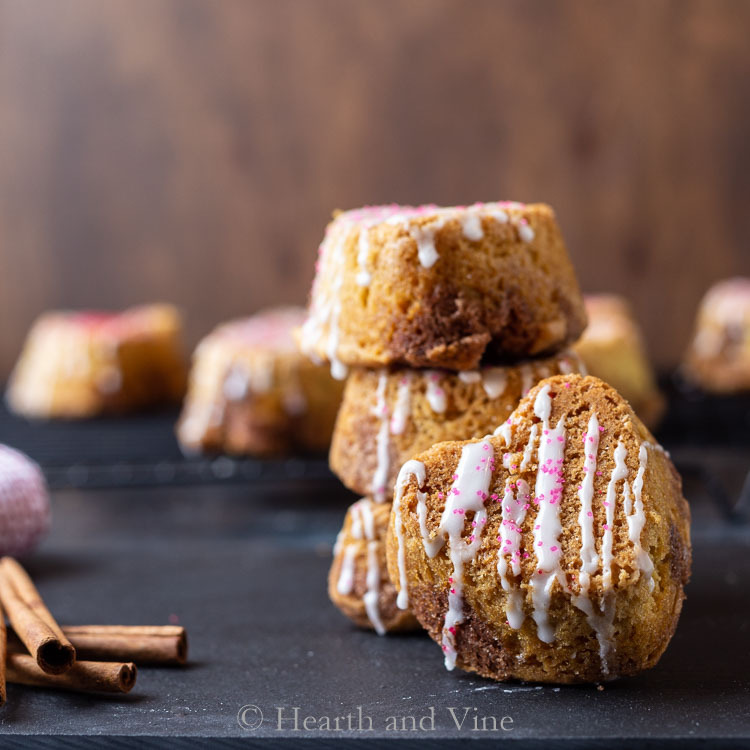 These mini heart cinnamon roll cakes make a great treat for anyone on Valentine's day, filled with a cinnamon sugar swirl and topped with a sweet glaze and pink sparkles. To make the cake, cream together sugar, butter, vanilla and eggs. Pour the flour mixture into the wet batter in 2 or 3 batches and mix together. Try not to mix it too much. Just enough to blend the two mixes together. Place the heart shaped baking cups on a baking sheet. Add 1/2 teaspoon of the cinnamon sugar mixture on top and using a toothpick swirl the two mixes together. Bake for 25 minutes or until a toothpick inserted into the middle of a cake comes out clean. Remove from the oven and let cool on baking sheet for 5 minutes. Move cups to a cooling rack and allow to cool for an additional 10 minutes. Remove the cakes from the cups by turning them upside down and gently pinching the cups all around and coaxing them out of the cups. I’m a huge fan of cinnamon! I put in everything from my oatmeal to my coffee! Your mini cakes are adorable and look delish and I’ll definitely have to try your recipe!! Thank u for sharing!! Have a blessed weekend! Thanks Christine. I think you’ll love them. These are so cute and love the dash of cinnamon on the inside. Cinnamon is such a great addition to the diet, I love it! Those heart cups are the best and would perfect in my new wave oven. Thanks for the link. Thanks Carole. The cups were really great to work with. I can see using them for sweet and savory recipes in the future. Maybe even crafts like candles or soap so they were worth the purchase.